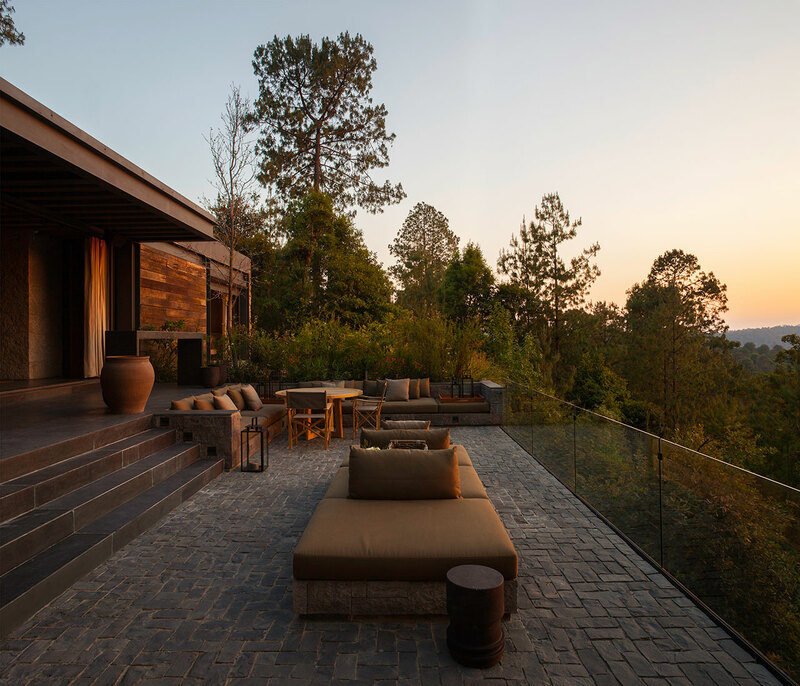 Casa El Mirador in Valle de Bravo, Mexico by CC Arquitectos. Photo by Rafael Gamo. 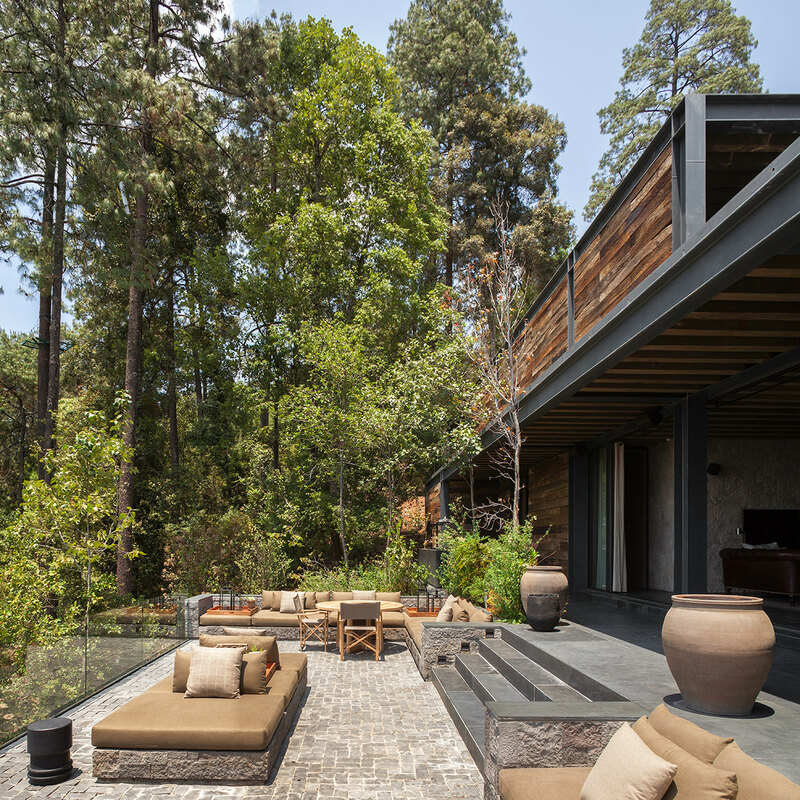 If buildings have their own language, then El Mirador’s is one inviting relaxation and respecting surroundings. 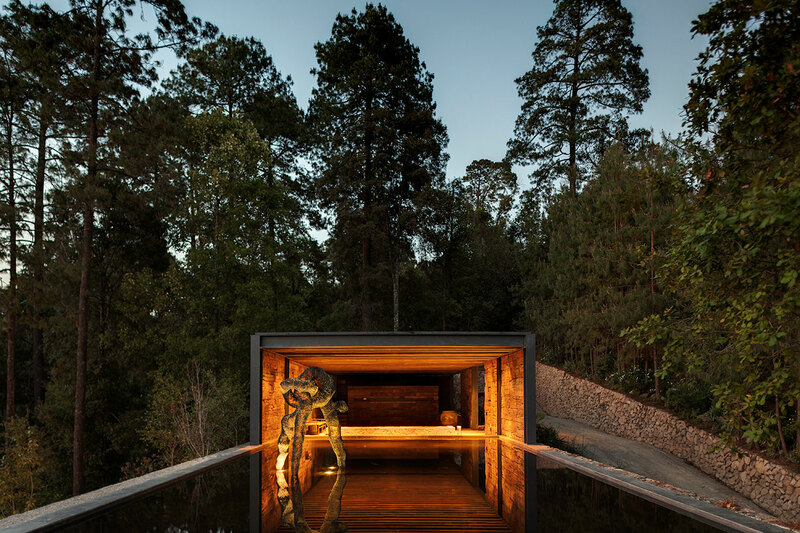 Built in 2013 by Manuel Cervantes Cespedes and CC Arquitectos, this single person dwelling is crafted from local materials both on the hillside as well as into the hillside which swoops down towards the magnificent lake in the midst of the private property of “El Eterno,” in Valle de Bravo, Mexico. 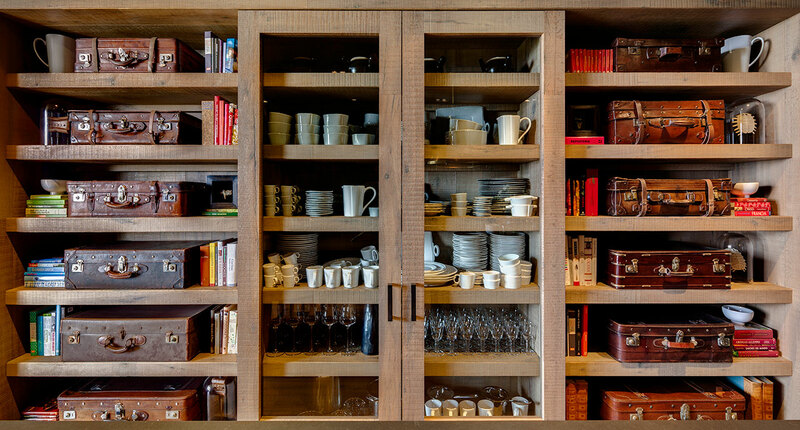 The residence has been meticulously deliberated and executed with reverence to its lakeside location and its owner’s personality. 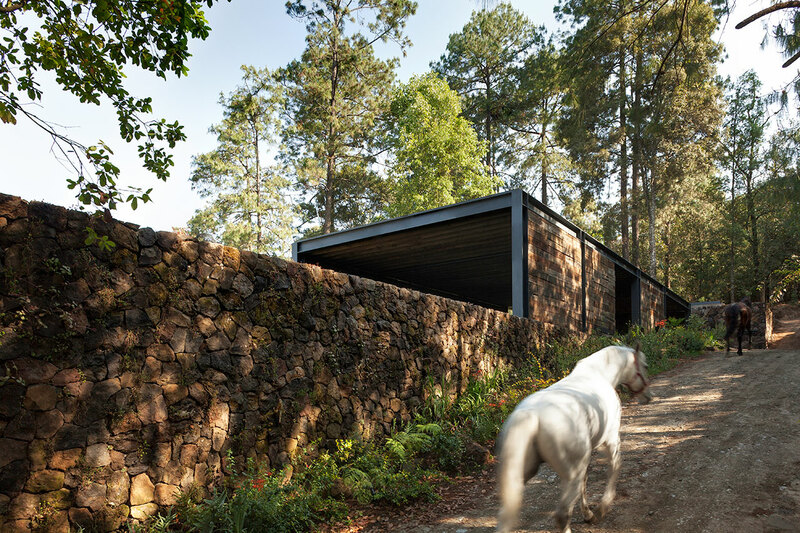 Upon approach, a stone embankment descends towards the structure on the roof of the pavilion. 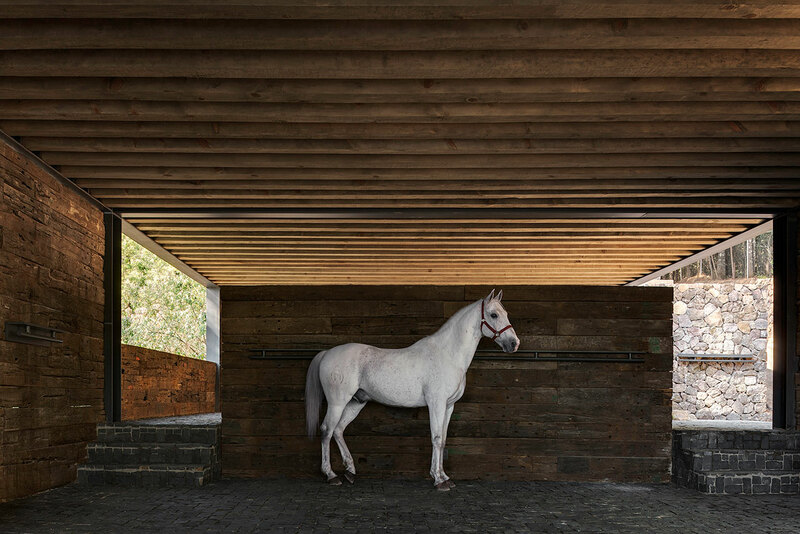 Built out of recycled railroad ties, this is then separated into two compartments: the first a horse stable complete with a water trough connected to a pool while the second is a garage that discreetly separates cars from horses behind a wooden wall. 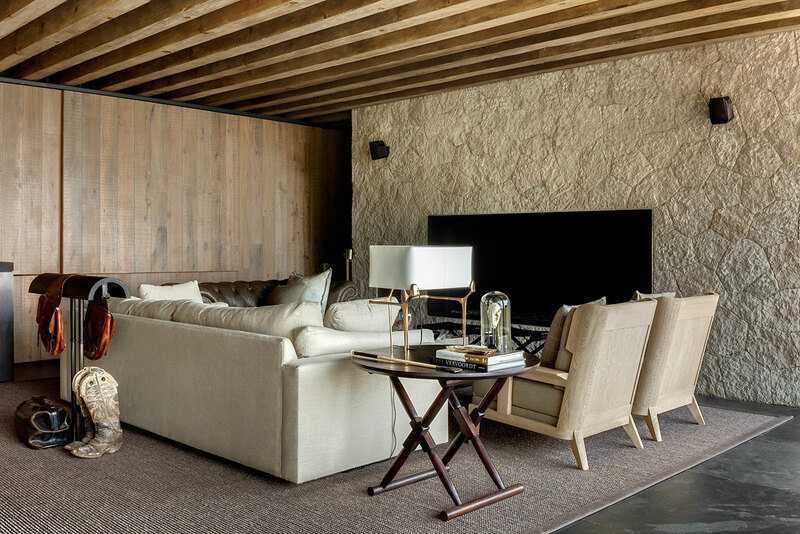 The hub of the steel and wood beam-structured pavilion is a spacious living room, featuring a window wall that opens to the inviting terrace and grounds, landscaped by Entorno, Taller de Paisage. 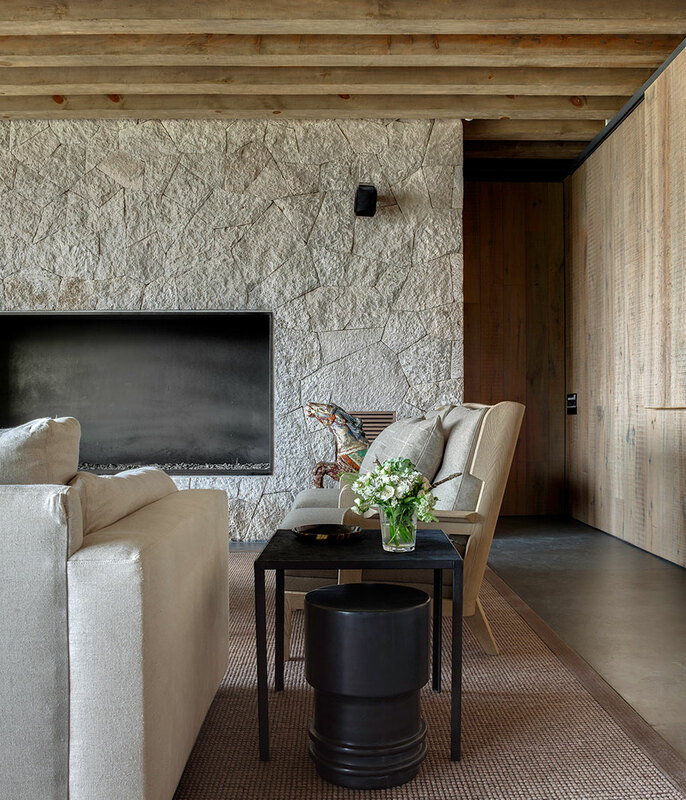 This feature enthusiastically embraces indoor/outdoor entertaining by eliminating demarcations as well as by the universality of appointed materials, such as the terrace’s slate and stone floors which continue inside, crawling up the facing fireplace walls. 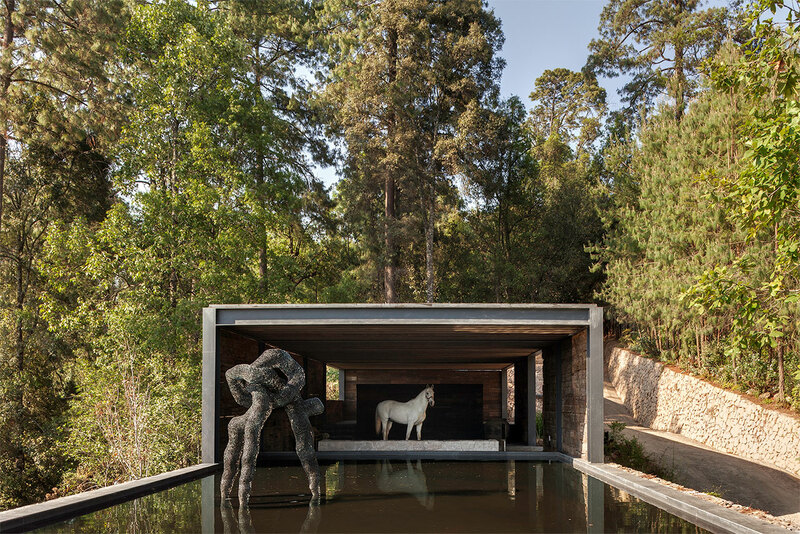 Mirroring the tree trunks of the surrounding forest, the fourth wall is wood clad while the ceiling features thick wood beams. 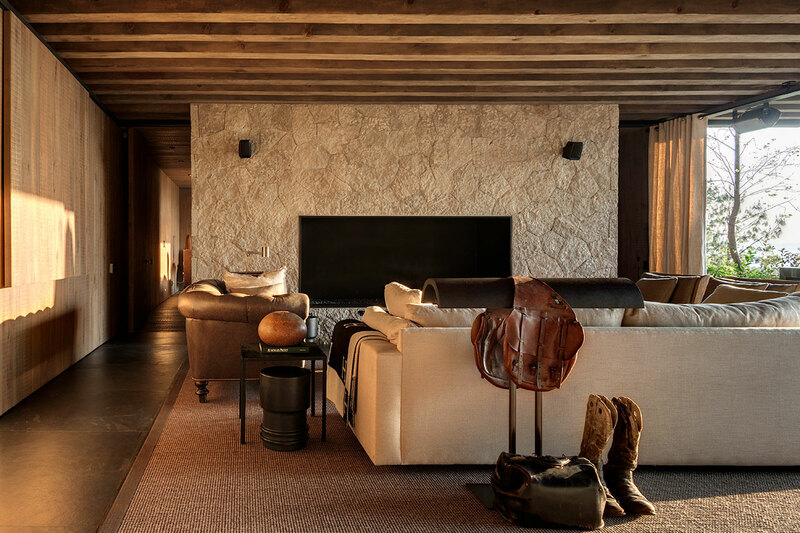 An abundance of natural colors and materials, such as the tufted brown leather sofa, knotted carpet, and twin, extra-deep and white couches, selected by collaborators Habitación 116, continue the serenity theme even further. 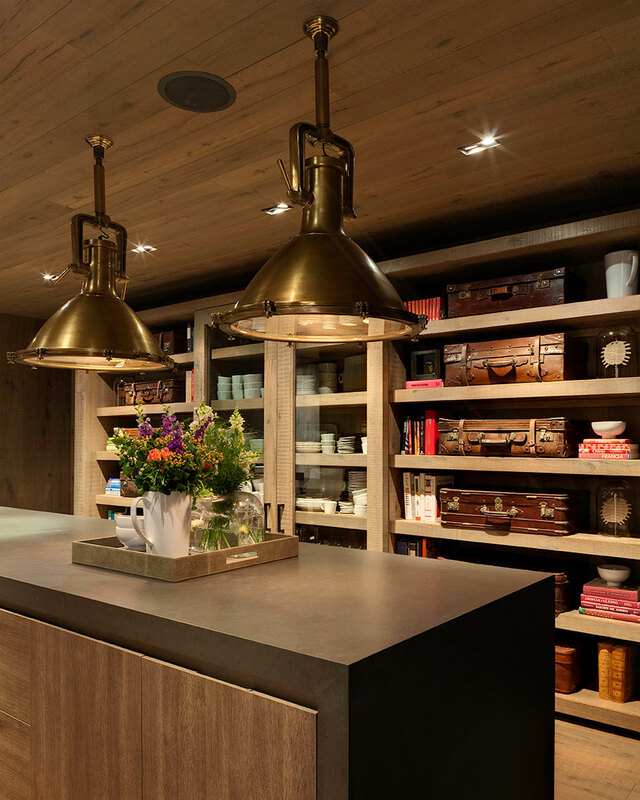 The wood kitchen, on one side of the layout, boasts an impressive shelving composition and a hefty slate center island—perfect for friendly cooking parties. 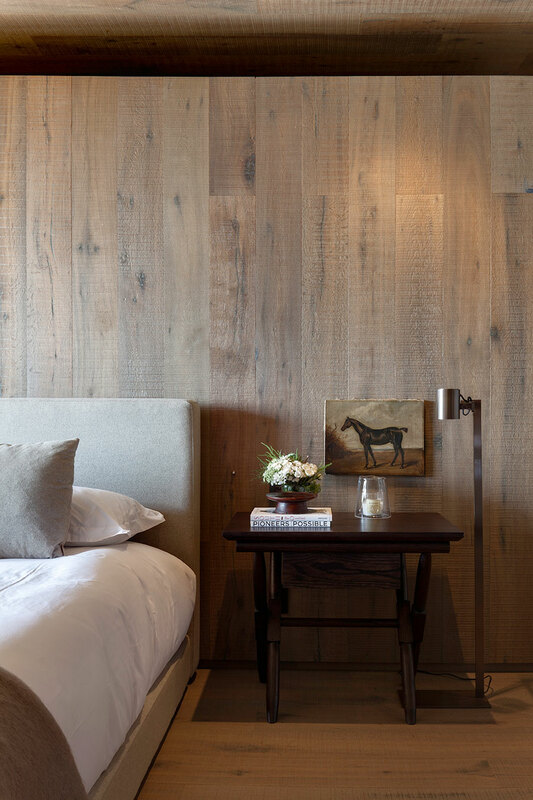 Meanwhile, across the other side of the pavilion, the master bedroom is an embracing, wood-sheathed nook that looks out over the forest panorama and boasts an attached master bath, encased in dark gray slate. 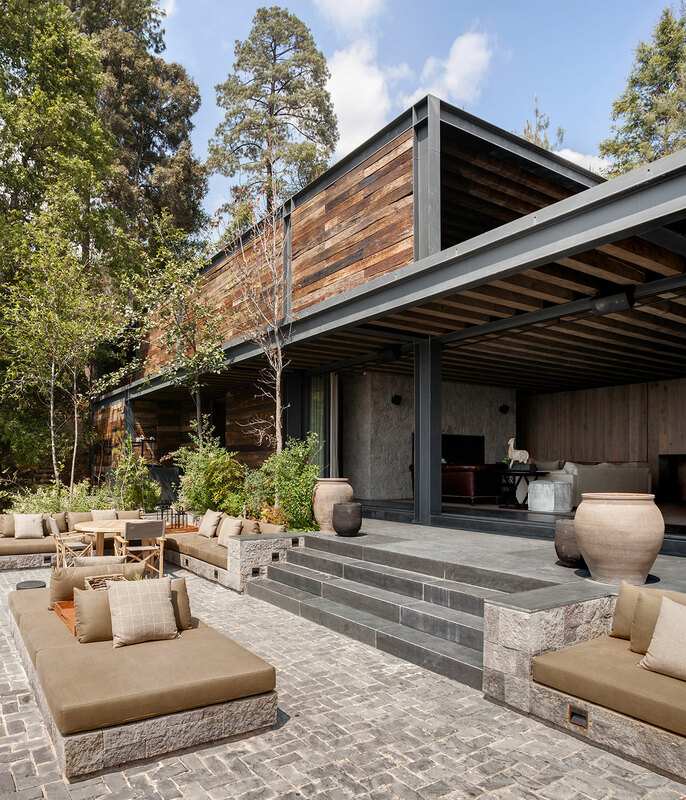 Offering the perfect opportunity for guests to take an afternoon dip in the lake and then enjoy a languid dinner on the patio, El Mirador is truly a modern, yet timeless, domicile built for entertaining while also providing friendly solitude. It will undoubtedly weather beautifully and as the years pass the qualities that made it wonderful to begin with will certainly only be enriched.